Oh for goodness sake, it looks like American Apparel and its CEO Dov Charney have secured yet another injection of neon spandex-clad life. Even after facing a year (or so … more so than not) of public image and financial troubles, it seems there’s nothing that can sink the AA ship and its ever-creepy captain. Dov Charney pleasures himself in front of a Jane reporter. The borderline-illegal creepiness starts (well, continues). Take that, anyone who likes (needs — me) eyeliner. Dov Charney releases his phone number to the public and actually picks up. 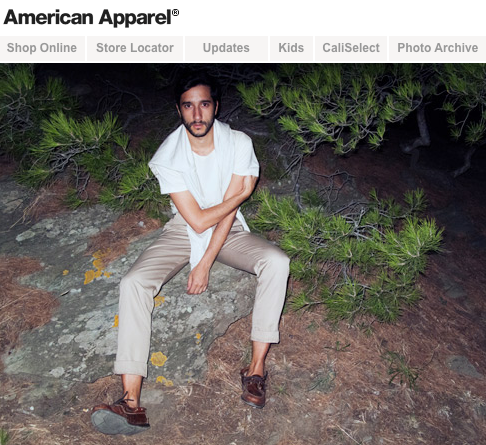 Dov Charney is hit with two sexual harassment lawsuits in one month. One of the suits names four former AA employees, three of which cannot disclose the nature of their cases, as they signed $1 million confidentiality agreements while employed with AA. New York Times reporter Laura M. Holson writes about the case, “Gary E. Phelan, an employment law lawyer based in Westport, Conn., said that while it was common for employers to seek arbitration to settle disputes, asking someone like a store clerk to sign a confidentiality agreement was not routine. ‘That is a red flag,’ he said. Dallas-based peformance artist Nancy Upton wins AA’s “The Next Big Thing” contest — after entering only to spoof the competition. AA is none too thrilled at her antics and, once crowned the winner, Upton is ousted (grrrrreat headline for anyone who needs it) from her top spot because, “while you were clearly the popular choice, we have decided to award the prizes to other contestants that we feel truly exemplify the idea of beauty inside and out, and whom we will be proud to have representing our company,” says AA Creative Director Iris Alonzo. Chief Business Development Officer Marty Staff leaves the brand, as does executive vice-president Adrian Kowalewski. Acting President Tom Casey quits. The SEC lets AA off the hook and decides not to investigate further. Crystal Financial and George Soros extend an $80 million line of credit and effectively rescue AA from (almost certain) financial ruin. And that brings us to today, and the near future, where we’ll have to put up with legs-spread-wide models for at least a few more months. Or years. We’ll see how long the credit lasts. But, hey, a fool and his money — am I right? Previous Would 1998 Carrie Bradshaw Be So Loved Today? Can I quote your article?